Click on the image at right for Pete Bsumek’s slide presentation on letter writing. Dr. Bsumek recommends this resource for letter writers: Writing and Submitting an Opinion Piece: A Guide. It is also available on The Earth Institute, Columbia University webpage here along with more resources. Also recommended is James Hoggan’s book Climate Cover-Up. The Climate Action Alliance of the Valley is holding an exciting workshop: “What to do when the newspaper makes you mad—or glad” on March 18th from 6—7:30 PM at the Massanutten Regional Library. Do you still read the newspaper despite the misinformation on many subjects? Bring an example! Do many editorials and opinion pieces upset you? Bring an example! Do some of the letters to the editor mystify you with their illogic or ignorance? Bring an example! Do some of these also entertain, educate, or inspire you and would you like to know more about how to write Letters to the Editor and OpEd pieces with the same impact? 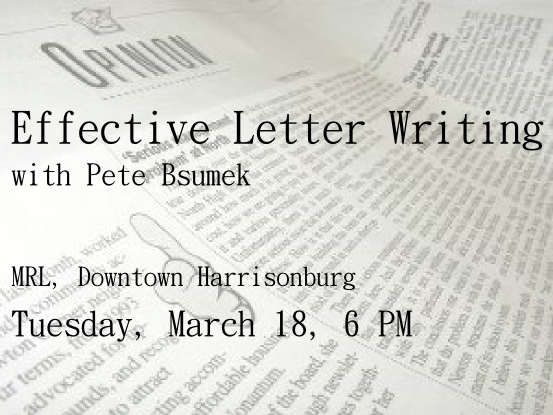 Come and find out how to do it from Dr. Pete Bsumek, an associate professor in the School of Communication Studies at James Madison University. He is director of the MA program in Communication and Advocacy and coordinator of the interdisciplinary Environmental Studies minor. Dr. Bsumek earned a B.S. in Political Science from the University of Utah, and an M.A. and Ph.D. in Rhetoric and Communication from the University of Pittsburgh. His research and teaching focus on rhetoric and the processes of advocacy and decision-making in social change, with a specific emphasis in environmental communication. He is currently working on a collaborative project investigating public controversies surrounding coal. Prior research focused on the rhetoric of the wilderness movement, processes of debate and deliberation, and greening the public relations curriculum. He is also currently serving on a grant funded research team investigating means for reducing greenhouse gases through low cost energy management and community based social marketing in university residence halls. Valley readers deserve a steady stream of accurate, informed, compassionate, and literate information and opinion on fighting and dealing with climate change. Each one of us can help.